The card game of bridge is being included for the first time in the Asian Games. At least two players are over 80. The main promoter of the sport at the games is 78-year-old Indonesian billionaire Michael Bambang Hartono. He is also playing. One player likened bridge to being the athletics of the mind. JAKARTA, Indonesia — What’s left of Finton Lewis’ thinning hair is spiked and dyed an orange-red colour. The 64-year-old Lewis says the haircut keeps him feeling younger on the outside, and playing the card game of bridge keeps his brain nimble on the inside. “I know I’m not as physically fit as most sports people are,” said Lewis, who is playing for India in the bridge competition at the Asian Games. Being fit doesn’t matter much in bridge, which is being included for the first time in the Asian Games. Fans like to talk it up as a “mind game” in the same realm as chess. Yang Kong Te of the Philippines is playing in the Asian Games at 85. Lee Hung Fong of Malaysia is 81. Indonesian billionaire Michael Bambang Hartono is a mere 78, and the big reason why bridge is on the schedule. His reported net worth in about $17 billion, a fortune made in tobacco, banking, and communications. To be fair, the median age of the field is about 50, which is still generations away from 9-year-old Indonesian skateboarder Aliqqa Novvery — the youngest of the more than 11,000 competitors in the Asian Games. The Olympic Council of Asia, which governs the games, reportedly balked at including bridge, which in the eyes of some is linked with card games such as poker, black jack — and hence, gambling. To be fair, bridge would be as out of place in a casino as bullfighting in Bhutan. The auditoriums set up for bridge are hushed, dotted with dozens of card tables with four players at each. At one session, curious photographers were given access for just five minutes, and then ushered away. 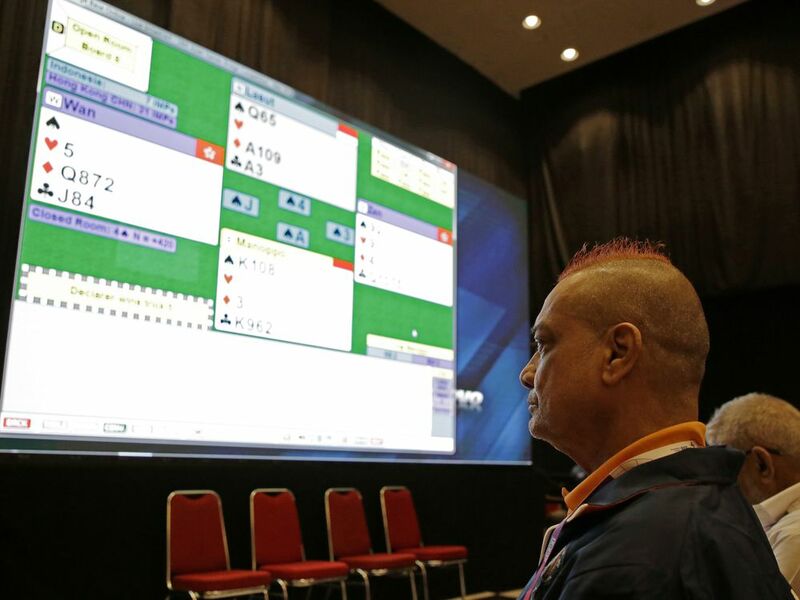 Fans can watch the hands that are dealt — and how they are played — on large television screens filled with the red and black symbols for spades, hearts, diamonds and clubs. There’s no age limit, and no language barrier. Abu-Jaber said she’s played against dozens of nationalities — on-line and in-person. The game has a universal language everyone understands, driven by English-rooted words like “no trump, slam, pass”and so forth. “You can play with anybody, even if you can’t understand their language and they can’t understand yours,” she said. Khan said attracting younger players might be easy since bridge offers sedentary thrills, perhaps like computer games. He argued that “defending a (card) hand well or making a special play” was just as exciting as serving an ace in tennis. He even pushed for inclusion in the Olympics, which seems unlikely.